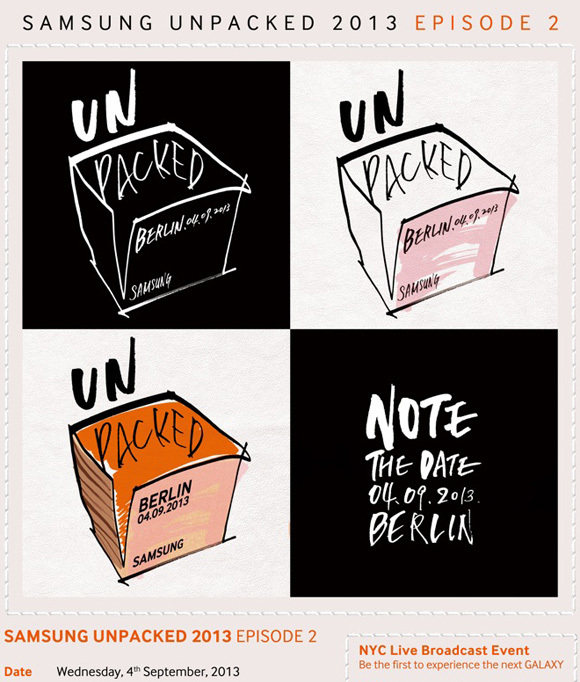 Samsung has just confirmed the date for its "Unpacked 2013 Episode 2" event that will take place in Berlin. The show will take place a couple of days prior to the start of the IFA 2013 expo is going to have the Galaxy Note III as its star. Samsung has even replaced the traditional Save the date tagline with Note the date to make it clear what it's all going to be about. There have been a ton of rumors regarding the third-generation Samsung phablet. Some reports suggest that Samsung hasn't decided on a screen size yet, while others suggest that the Exynos 5420 Octa is going to be powering the smartphone. While the company's new octa-core CPU would certainly not be slow, rumors suggest that Samsung is going to provide an alternative version of the Note III powered by the Snapdragon 800 chip. Samsung is going to livestream the event on its YouTube page, but we'll be on the ground live to give you everything there's to know regarding the Galaxy Note III and whatever else the company announces (a smart watch is mentioned quite frequently lately). The summer may be heading towards its end in the beginning of September, but the technology world is just starting to heat up. Stay tuned!